Not much beats the fun and freedom of bouncing on a trampoline. Also, it can be a great source of exercise for kids and adults alike. Nowadays, many American families are choosing to have their own trampolines at home in the back yard. However, with many makes and models on the market, it can be hard to know which trampoline to purchase for your family. A brand that has recently caught our eye is the Kidwise Magic Circle trampoline. So, would this type of trampoline be a good purchase for you? Read on for our Kidwise Magic Circle Trampoline Review. Are Magic Circle Trampolines Good? How is Kidwise trampoline assembly? How does Kidwise compare to other brands? Where do I find a Kidwise Magic Circle trampoline for sale? Magic Circle offer a range of trampolines in a variety of sizes. Below, we've outlined the key features of each product. Before you settle on a size, it's important to measure up your yard carefully first including a safety boundary. Read on for a rundown of each model. This is the largest trampoline offered by Magic Circle. If you have the space, a really big trampoline can be great fun, especially for kids. However, do not underestimate just how big a 16 foot trampoline actually is. You will need to check that you have the required space first. 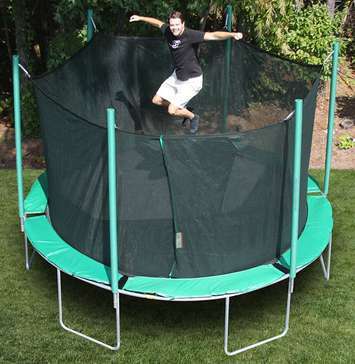 If you think a 16 foot trampoline is for you, read on for the key features of this product. Check latest price on Amazon here. Integrated safety cage: The Magic Circle safety net is designed to be low maintenance and is an important safety feature. It provides extra safety by preventing your kids from bouncing off the trampoline, which can cause nasty injury. 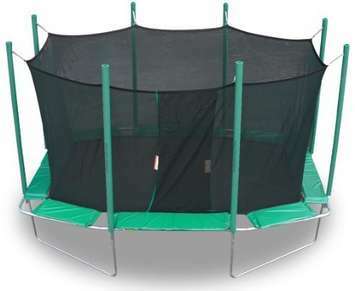 No-gap structure: The safety net is securely attached to the trampoline so there are no gaps between the jumping mat and the trampoline frame. This improves the safety and security of the trampoline as getting arms and legs stuck in the gap where the springs are can be dangerous. ​U-shaped legs: These improve the stability of the trampoline even during enthusiastic bouncing. It also prevents the trampoline from shifting position while you jump. Octagonal jumping surface: Why an octagon? Well, an octagonal surface allows a greater overall surface area than a traditional round trampoline. Therefore, you have a little more space for bouncing than if you bought a circular trampoline of the same size. At a slightly smaller size, this model still gives a large enough surface area for lots of bouncy fun. 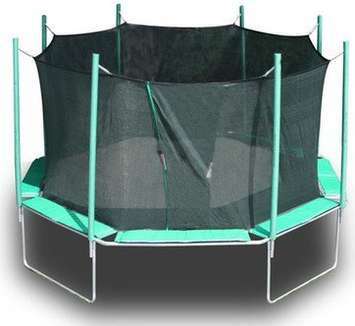 If you prefer the look of a traditional round trampoline, this may be a good purchase for you. So, what are the key features of this model? Click here to check latest prices on Amazon. U-shaped legs: This trampoline has 6 U-shaped legs. This leg shape is ideal as it makes the trampoline more stable during use. Also, it keeps the trampoline securely in position so it can't shuffle around during heavy bouncing. High-tensile safety net: The trampoline has an integrated safety net with a high tensile strength. 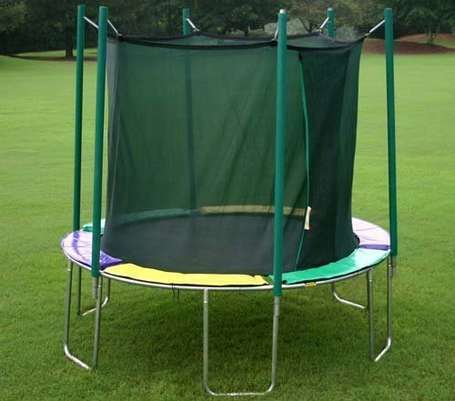 This increases safety and prevents adults or kids from bouncing off the trampoline and hurting themselves. Furthermore, its high-tensile strength prevents it from ripping if someone bounces against it. 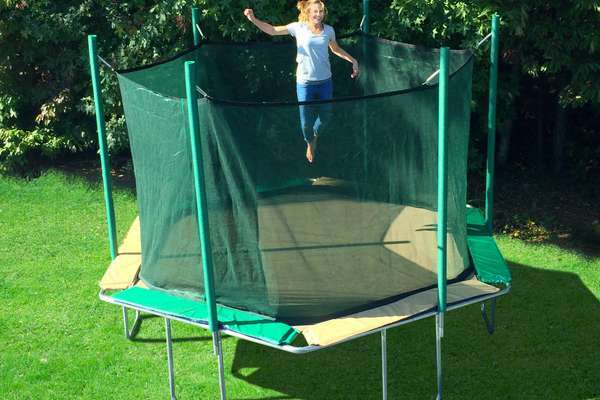 ​No-gap construction: Like the other models on this list, the net is sewn directly to the trampoline. This prevents people from falling down the gap where the springs are, or getting limbs stuck. As this can be painful and dangerous, this is a great safety feature. For those who want a rectangular trampoline, this is another larger-sized option that may suit you well. So is the Magic Circle Rectagon trampoline worth your consideration? Read on to find out! Strong and sturdy safety net: This trampoline has a safety net to prevent anyone from bouncing off the trampoline and injuring themselves. Furthermore, it has an extremely high tensile strength. This makes it more durable and prevents it from tearing. Therefore, it offers excellent protection even if a heavy user falls against it. U-shaped legs: These make the trampoline very stable, increasing the safety of the product. Furthermore, they keep the trampoline firmly in position during use. ​No-gap construction: The safety net is sewn into the trampoline. This means that users cannot access the gap between the frame and jumping mat where the springs are located. Falling down this gap can pose a real danger, especially to children ,so it's great that Magic Circle have addressed this in their design. Unique 'rectagon' shape: This trampoline has an unusual shape. It is like a narrower hexagon, hence the name 'rectagon'. This allows a greater bouncing surface area for the amount of space it takes up in your yard. ​Click here to check latest price on Amazon. If you have a little less space in your yard, this trampoline may be a better fit for you. This is another traditionally-shaped round trampoline, but despite its smaller size it has the same features as the larger models. Check latest price here. U-shaped legs: Like the other Magic Circle trampolines, this trampoline has U-shaped legs. Despite being smaller, this model still has 6 legs. This is a bonus, as more legs of this shape make the trampoline more stable. Safety net: The safety net is extremely strong and integrated into the structure of the trampoline. This prevents any nasty accidents caused by falling off the trampoline. It's strength allows it to withstand people falling or bouncing against it. Therefore, you are protected from rips and tears, even if a heavy user bounces into it. ​No-gap structure: This model also boasts the no-gap construction of the other Magic Circle models. This prevents nasty accidents from body parts getting stuck between the springs. This increases the overall safety of the trampoline. Magic Circle trampolines have received excellent user reviews. In fact, many of the models have all 5-star reviews on Amazon with a high level of user satisfaction. 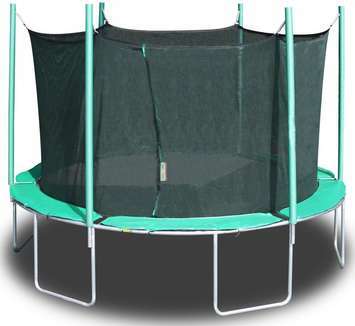 Many users comment that their trampolines are very sturdy and provide a high-quality bouncing experience. Although the trampolines are towards the more expensive end of the market, a lot of buyers have commented that it's worth spending the extra money for the quality. Magic Circle are a trampoline manufacturer based in the USA. They have a very good reputation in the industry for creating trampolines that are strong, fun to use and, most importantly, safe. Overall, we believe that the quality of the Magic Circle trampolines is high. The frame tubes are galvanised, making them extremely strong and durable. Also, the nets on these trampolines are very high-quality. Because they have a high-tensile strength, they are resistant to rips and tears, which could make the trampoline net less secure. Furthermore, the foam protectors on the enclosure poles are UV resistant. This prevents them from perishing in strong sunlight, prolonging the overall product life. Magic Circle say that their trampolines take around half an hour to put together. They provide an instruction manual to help to simplify the assembly process. Also, most customers agree that assembly of the products is reasonably straightforward, especially compared to some other brands on the market. However, it's important to note that a spring assembly tool is not included with the trampoline. As a spring tool makes attaching the springs much easier, we recommend purchasing one to aid with the assembly. It's also sensible to purchase protective gloves and glasses, because springs can ping off as you try to attach them and potentially hurt your fingers or eyes. Spring tools are not especially expensive and can be bought easily from Amazon. Unfortunately, we were unable to find any additional accessories such as basketball hoops or tents to go with Magic Circle trampolines. If you have kids, add-ons such as these can be a great way to add an extra element of fun to your trampoline. They also help make your trampoline multi-purpose. Therefore, this could be a potential drawback to Magic Circle trampolines if you have kids and want to use your trampoline for camping or games. Kidwise Magic Circle trampolines are comparable in terms of quality to leading premium brands. However, there are a few features of Magic Circle trampolines that make it stand out from some of its competitors. First, Magic circle offer a range of shapes, including hexagonal and octagonal trampolines. These give a higher bouncing surface, which can add to the fun of using your trampoline. Also, Magic Circle trampolines have the highest weight limit of any trampolines currently for sale in the USA. This means that your trampoline can be used safely by every member of your family. Also, it can easily take the weight of several kids at once. In terms of price, Magic Circle trampolines are more expensive than many competitors. However, given their excellent quality, you may feel it is worth spending the extra money. Kidwise Magic Circle trampolines have an upper weight limit of 450 pounds. This is the highest in the industry and is one of the stand-out features of these trampolines. The weight limit is the same whichever model you go for. This makes the trampolines safe for use by plus-size users, or several people at once as long as their combined weight doesn't exceed the limit. We were unable to find Magic Circle trampoline replacement parts on Amazon. However, many specialist online retailers do stock a range of replacement parts specially designed for Magic Circle trampolines. We recommend using these instead of generic trampoline parts, as they may not be a suitable fit for your model. Overall we are impressed with the Magic Circle trampoline models and feel these products have a lot of benefits. Here is a quick rundown of the pros of Magic Circle trampolines. Range of shapes and sizes: We especially like the octagonal and 'rectagon' options as they provide a higher surface area for bouncing. Simple assembly: A common grumble with trampolines is that they are a pain to put together. We're glad to hear that this easier with Magic Circle trampolines. Excellent safety enclosure: The strength of the safety net and the way it is attached to the trampoline makes it extra-safe. You cannot fall down the gap where the springs are and the enclosure is strong enough to withstand people falling against it without tearing. Unlike some other brands, Magic Circle do not sell a range of accessories for their trampolines such as clubhouses tents or basketball hoops. However, many families like to have these accessories to make their trampolines multi-purpose, especially if they have active kids. We would like to see Magic Circle adding to their range by including accessories of this kind for their trampolines. Also, the inclusion of a spring tool with the trampolines would be an improvement. This would make assembly of the trampolines easier and safer to assemble. Also, the high price of these products may put them beyond the budgets of many buyers. Luckily, it's easy to purchase a Kidwise Magic Circle trampoline for your own backyard. All the models we've reviewed in this article can be easily purchased online on Amazon.